So many students have tried to sell their College-allotted tickets to the Harvard-Yale football game this year — a violation of Athletics Department policy that typically goes unnoticed and unpunished — that some resident deans have begun admonishing students over internal House email lists. “We take this [policy] seriously and expect our students to comply,” Athletics Director Robert L. Scalise wrote in an emailed statement. 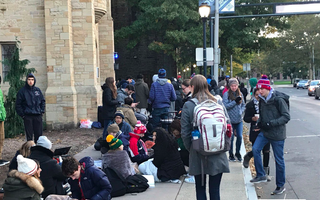 Despite the policy, at least a hundred students have attempted to sell their tickets for amounts ranging from $25 to over $200. Most advertised their tickets on House email lists or on a public Facebook event page. Maxwell K. Ho ’21 offered his ticket up for $115 “OBO” — slang for “or best offer” — over the Eliot House email list. He said he was unaware Harvard forbids resale. 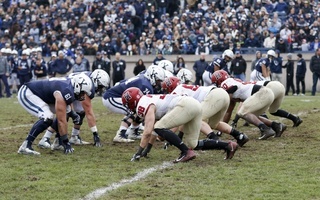 Aside from financial motivations, students attributed the spike in ticket scalping to the fact that this year, in a break with tradition, the Game will be played not in Harvard Stadium but in Fenway Park. And, unlike in the Stadium, Harvard undergraduates will face strict ticketing rules in the famed Boston baseball shrine. Fenway Park policy stipulates that all students must sit in assigned seats during The Game. If students wanted to sit with a particular group of friends, they had to pick up game tickets together as a group. So far, undergraduates do not appear particularly pleased with new rules. Students previously complained to administrators that Fenway's rules are inconvenient and deleterious to the overall experience. After noticing online chatter about ticket sales, a number of resident deans sent nearly identical emails to students reminding them that ticket resale violates University policy. The Office of Academic Integrity and Student Conduct did not respond to requests for comment. In her email, Chavers underscored The Game’s role in fostering a sense of community among Harvard students. “Instead of being an anonymous resource that you are free to dispose of as you wish, the purpose of offering each student one ticket is to provide an opportunity for you to build your community and enjoy school spirit together,” she wrote. Some students said the ticketing rules specific to Fenway Park have already eroded a sense of community. They suggested ticket resale might help restore it. Chavers and other resident deans also reminded students that the free tickets are a “gift,” though some students said they disagreed with that idea. By contrast, Yale undergraduates must pay $25 per ticket. Jacobsen-Peregrino said the new ticket policy and the sale of those tickets over email lists marks a departure from a storied Harvard tradition.